We live in a world where even bug bites now are pretty scary. You never know if you're going to have an allergic reaction to one! If a certain spider bites you, you could die. If a specific tick bites you, you could get Lyme Disease. Beyond using epi-pens, we have some helpful ways to treat bug bites yourself, plus some clever ways to avoid getting bit in the first place. Real people share their best tips for preventing and treating tick bites, mosquito bites, spider bites, dust mites, bedbugs, lice, and more. Do you know the best way to remove a tick? I do. I do it all the time. I’ve removed DOZENS of ticks from myself, my husband, and my dogs! I’ll show you — from my own experience using tweezers and videos from others showing easy ways to remove ticks without tweezers. Do you know which ticks carry Lyme Disease? I’ll tell you — so you’ll know which ones to look for where you live and exactly what they look like. What is the best tick repellent for humans, you ask? Well, have you heard of Permethrin spray? When it comes to repelling ticks, avoiding Lyme Disease, and buying tick repellents… we recently learned a little secret from the U.S. Military. It’s called Permethrin! If it’s good enough for the Department of Defense, then it’s good enough for us. Here’s why we use Permethrin anytime we go in the woods now. By the way, it repels both ticks AND mosquitoes… far better than DEET-based products do. There’s a difference between home mosquito control and insect repellents. See what makes each of these mosquito preventatives unique, how using natural mosquito repellent sprays can help, and why they’re better than other mosquito repellents on the market. Bug Bites & Allergic Reactions: Benadryl To The Rescue! Spring is in the air and so are insects like bees, wasps, and mosquitos! An allergic reaction to bites or stings from any of these can be very scary… and sometimes even fatal. Always keep Benadryl on hand and know these allergic reaction symptoms to watch for — to keep your kids, your pets, and yourself safe. 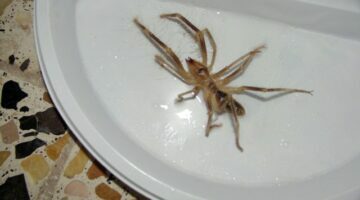 The camel spider is also known as a wind scorpion, sun spider, and wind spider. They are mostly found in the southwest U.S. and in southern Africa. Camel spider size, speed, and dangers are explained here. Hate mosquitoes? Here are some of the best ideas for making your own all-natural mosquito repellents, plus a few organic mosquito repellents you can buy.